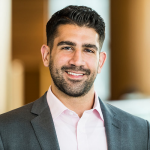 George Khalife is the Director of Business Development & Marketing at Sampford Advisors, an M&A advisory firm for Canadian technology companies. Previous to Sampford, George led sales initiatives in Toronto & New York focusing on sourcing new listings for the Toronto Stock Exchange. On the side, George hosts a podcast called Let’s Grab Coffee where he interviews successful entrepreneurs and is the co-founder of BookBack, an app for university students to buy and sell books.